Where some see trash in those free promotional items you get at a street fair, summer festival, or convention, called swag in the PR buiz for Stuff We All Get, I see it as something to remake into treasure. Now that the summer is almost over - sob! 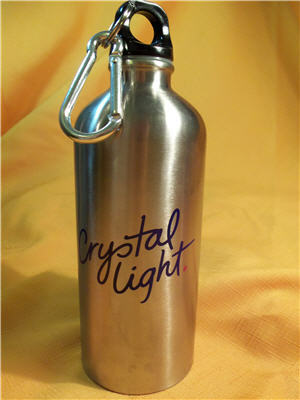 - I have several free stainless steel water bottles I got from various events. I like that the metal bottles keep water colder longer than my BPA free plastic water bottles. However free doesn't always come with cute, like this water bottle I got from Crystal Light at Blogher. A little Modge Podge, scrapbook paper, paper punches, laser printer, and smarty pants attitude later I remade that water bottle into something I want to show off around town. 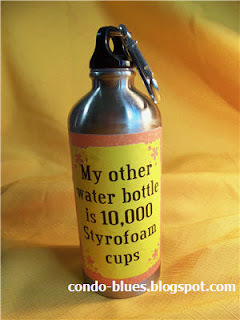 It says My other water bottle is 10,000 Styrofoam cups. Do you think people will laugh with me or beat me with a stick when I take my new water bottle to my next green event? Let’s see what you came up with! The rules are simple. Use the Linky below to submit your reuse/revamp/remade or swag thing you find useful blog post to Condo Blues. Please put a link at the bottom of your post back to Condo Blues so everyone will know that you are participating in my Remake Your Swag Link Party. I made a button if you want to use it to make it easy for you! Reminder: You can still enter my 1000 Ideas for Creative Reuse Book Giveaway until midnight tonight! I can’t wait to see what you’ve come up with!